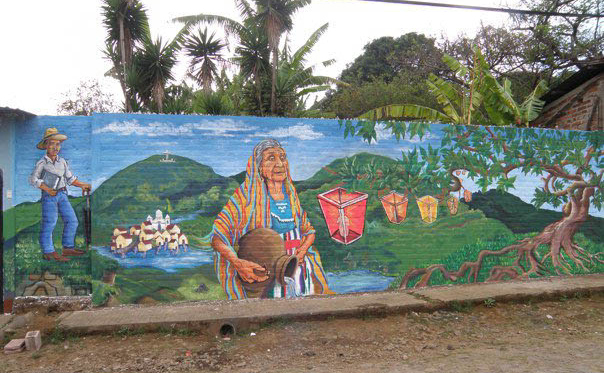 “This mural is dedicated to the People of Ataco, El Salvador by the Artists of SPARC. The Mother Weaver- is the weaver of life and with colored threads on her loom flowing in two directions from the center wall, she transforms them into water and the land. The threads from the loom transform a second time to become clotheslines upon which Ataco women tending to their family chores hang laundry. The clothes they hang contain their dreams; on the first shirt a woman takes her child and leaves a raging abusive partner, on the second her husband becomes a loving father tending his child, on the third, she becomes a graduating student and in the foreground two young women are depicted as a students and artist. In the background women travel far distances on the cobbled road to wash their family’s laundry. The final panel contains the completed weaving in which all the women of Ataco have participated and present to their community. It contains a weaving of la ceiba tree, la maiz, frijol, and agua, the sacred resources needed to nurture and sustain life. Clean water flows down from the volcanoes. It runs through the ancient ruins of Ataco, symbolically drawing clarity from the past. A severed ceiba tree cuts off the river as trash burns in the distance. The hand of a young woman and the spirit of the jaguar halt deforestation and the polluted river. (Image Four) A torogoz oversees a coffee field and an indigenous drummer stands next to traditional spools as they turn cotton into thread to be used by the Mother Weaver of life. Tomas Fidias Jimenez stands before the village of Ataco. It symbolically represents the earliest city built on a lake. Beneath him is part of an undiscovered Mayan ruin. The eldest woman of Ataco carries the water from the lake, now extinct. Fahrolitos hang from the branches of a tree in honor of the tradition held by the people of Ataco. A child sits between work and studies. From his mind a kaleidoscope of ideas emerge as he watches a group of children playing “Peregrina.” On his right a family shows their daughter a window to the world. (Image Seven) A visual metaphor for raising a baby as a bean that needs water from a nurturing hand to sprout. (Image Eight and Nine) A painting made by children contains wishes of what they want to be when they grow up. They are flanked by two large portraits of young girls, behind one of which a paintbrush flows into a river teeming with fish. Nahuatl codices of animals and their environment line the bottom of the mural. 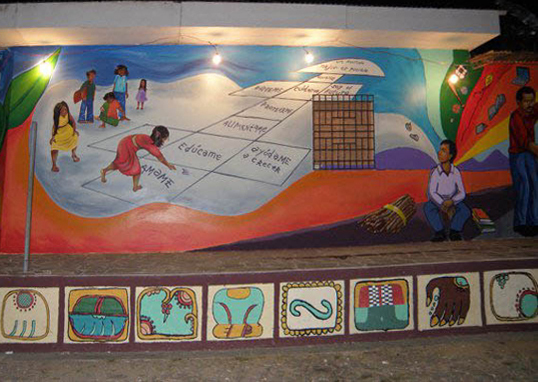 Graphics based on ancient pre-Mayan stonework from local archeological sites winds around the wall to remind the Ataco community of their Mayan history. The images represent the continual human presence in the area from c. 1800 BC onward to present day, in which a still hidden city lies beneath the cemetery and local coffee farmlands. Intricately carved jaguar heads are found next to a large snake, behind which water flows through the carved stones. (Image Eleven) Mayans are found to the right of a large gold jaguar head playing flutes and performing rituals that have since evolved into current traditions in Ataco. The Pipil Indians, descendants of the Aztecs, likely migrated to the region in the 11th century. In 1525, Pedro de Alvarado, a lieutenant of Cortés’s, conquered El Salvador. In the 1970s, discontent with societal inequalities, a poor economy, and the repressive measures of dictatorship led to civil war between the government, ruled since 1961 by the right-wing National Conciliation Party (PCN), and leftist antigovernment guerrilla units, whose leading group was the Farabundo Martí National Liberation Front (FMLN). The U.S. intervened on the side of the military dictatorship, despite its scores of human rights violations. Between 1979 and 1981, about 30,000 people were killed by right-wing death squads backed by the military. José Napoleón Duarte—a moderate civilian who was president from 1984 to 1989—offered an alternative to the political extremes of right and left, but Duarte was unable to end the war. In 1989, Alfredo Cristiani of the right-wing Nationalist Republican Alliance (ARENA) was elected. On Jan. 16, 1992, the government signed a peace treaty with the guerrilla forces, formally ending the 12-year civil war that had killed 75,000. In 1998, Hurricane Mitch devastated the country, leaving 200 dead and over 30,000 homeless. In Jan. and Feb. 2001, major earthquakes struck El Salvador, damaging about 20% of the nation’s housing. An even worse disaster befell the country in the summer when a severe drought destroyed 80% of the country’s crops, causing famine in the countryside. In 2004, Antonio Saca of ARENA was elected president. The nation implemented a free-trade agreement (CAFTA) with the U.S. in March 2006, the first Central American country to do so. Mauricio Funes, a former journalist and member of the FMLN party, was elected President in March 2009, ending two decades of conservative rule in El Salvador.